5Linx Marts & Services Ltd is the trading arm of 5Linx Group. The unit is into distribution and direct sales of general goods. Our products range from Household Items, Home Appliances, Office Equipment, Electronics, IT/Office Consumables, Mobile phones, as well as Supermarkets Items. 5Linx Marts & Services Ltd is also a NAFDAC certified importer and distributor of consumables such as Groceries, Candies, Cookies, Chocolates, Chewing Gums etc. We are a major Distributor to most Manufacturers of FMCG. Our Business Model allows you to acquire items to meet urgent and medium term needs, with the option of installment payment. This opportunities allows you to purchase your desired products at an initial lower cost and pay the balance over a period of time. 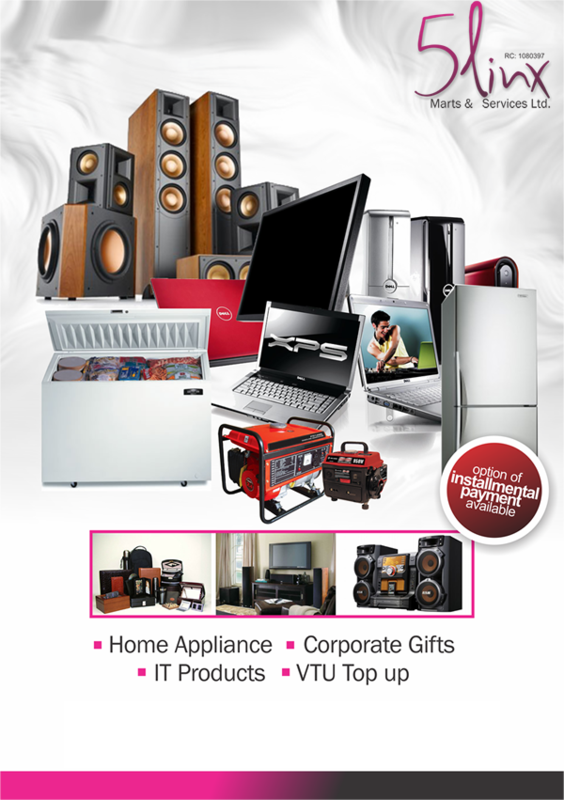 5Linx Marts & Services Ltd. has established relationships with some of the top brands that produce Office and Home Appliances and allows us the opportunity to provide these appliances to our clients at convenient rates spread over a period of time. Customer makes 30-40% initial payment for interested item and spreads the balance over the next 2 months. Purchase repayment tenor of 3 months. P. O. Box 16656, Ikeja Lagos, Nigeria.